HBO's Game of Thrones’ penultimate season five episode strays even further away from the plot of George R. R. Martin's novel, A Dance With Dragons. The closer we get to the end of Games of Thrones’ fifth season, the more the HBO series pulls away from the George R.R. Martin novels upon which they are based. That was as true as ever in the season’s penultimate episode. 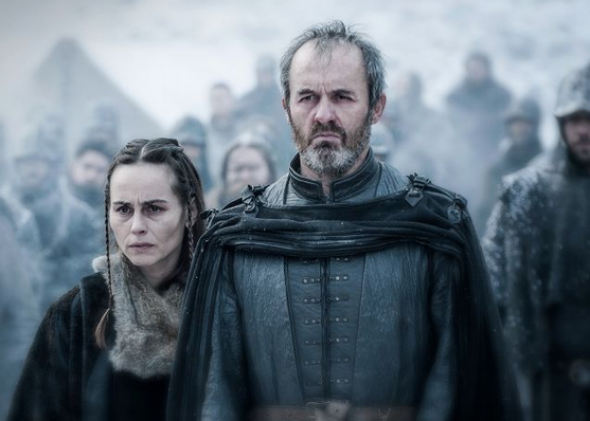 Is the Stannis of Martin’s imagination as cruel as the one on TV? Do Braavosi brothels really let in fishmongers? Can you really ride a dragon without a saddle? Coming off of last week’s battle with the White Walkers and their army of undead wights, Jon Snow and Tormund Giantsbane return to the Wall with a host of rescued Wildlings in tow. This streamlines what happens in the books, where Jon remains at the Wall. Instead, he sends an emissary to Tormund, who brings a host of Wildlings to—and then through—the Wall after coming to terms with the Night’s Watch. Meanwhile, Jon sends another Night’s Watch commander to Hardhome—and when that mission goes awry, he sends Tormund to the rescue. Can I get something off my chest, though? Last week, Jon & Co. fled the White Walkers by sea. Why, then, would they march north of the Wall? Shouldn’t they have sailed to Eastwatch-by-the-Sea, the easternmost Night’s Watch castle, and then marched back to Castle Black from the southern, safer side of the Wall? Well, no, because then we wouldn’t have had the tense moment in which Alliser Thorne hesitated to allow Jon and the Wildlings through—the latest foreshadowing that Jon’s leadership of the Watch, and the alliance with the wildlings on which he is taking it, remains perilously fragile. In the books, Jaime isn’t in Dorne, the princess Myrcella is in a different manner of danger, and Trystane isn’t the only child of Prince Doran Martell. But Sunday night’s Dorne sequences served a similar purpose as some of the action in the book: They showed us that Doran might be playing a longer game, that he’s willing to play ball with the Lannisters but appears to have some other scheme in the works. At the end of the fifth and last-published Song of Ice and Fire Book, A Dance With Dragons, that involves dispatching his intimates and allies all over Westeros. Here, whatever Doran is planning begins with a surprisingly warm encounter between Jaime and Ellaria Sand. As in the book, Arya is given an assassination target as part of her training with the Faceless Men—but here, she doesn’t go through with it thanks to the unexpected arrival in Braavos of Mace Tyrell, there to renegotiate the crown’s debt to the Iron Bank of Braavos. Joining Tyrell is Ser Meryn Trant, who at this point in the books is basically up to nothing in particular. But! He is one of the names Arya recites in her “prayer” each night—i.e., she’s planning to kill him—so on TV, she follows him and his men to a brothel, where, in what is not even the most horrible thing to happen this week, Trant is looking for the youngest possible girl. This subplot isn’t over, and it’s fair to assume Arya is about to attempt to cross a name off her list. Not only that, though: While the appearance of Trant in Braavos is new, a preview chapter of Martin’s upcoming The Winds of Winter features a somewhat similar sequence: Arya, now training with a band of mummers, encounters a different party of Westerosi that has come to negotiate with the Iron Bank. That party includes another name on Arya’s list, Raff the Sweetling. What happens to him—it involves the pointy end of a blade—is a big clue about what’s in store for Ser Trant. As on the show, the Daenerys plot of A Dance With Dragons climaxes with the reopening of the fighting pits, a scene that concludes with the queen’s disappearance on the back of her largest and fiercest dragon, Drogon. Otherwise, the differences are substantial, even though both interpetations are among the most thrilling in the series. In the book, Tyrion and Ser Jorah remain outside the city, not at her side and fighting in the pits, respectively, as they are on the show. Nor do the Sons of the Harpy attempt to stage an outright coup, as they did last night, plunging the fighting pit into chaos. Nor does Drogon arrive to rescue the queen; instead he is drawn by the fighting, and Daenerys must tame him lest he kill innocents. And whoa. Let’s unpack what’s going on north of Winterfell piece by piece. In the books, Stannis can’t send Ser Davos back to the Wall to ask for supplies, because Ser Davos is on another mission, hoping to rally other great houses of the North to Stannis’ cause. And while Stannis is slowed by a snowstorm in the book, his camp isn’t ambushed by Ramsay Snow’s men. Most consequentially: In the books, Stannis doesn’t take his daughter Shireen or his wife Selyse with him as he attempts to march on Winterfell. At first they remain at Eastwatch-by-the-Sea, but eventually relocate to Castle Black, where they remained at the close of A Dance With Dragons. Not so on TV. With his army on the brink of destruction and winter having set in, Stannis presumably follows the advice of Melisandre, dooming his own daughter to the flames in order to make a sacrifice of king’s blood—an invented-for-TV moment that serves to undo any shred of humanity Game of Thrones has endowed Stannis with over the last several seasons, underscoring his fanaticism and cruelty.